Measurements: 2.3 x 3.95 inches; or 58 x 100 millimeters. Smallish. Back of card: Solid magenta with white border & zzz motif in center. Can be inverted. Book included: Yes, 344 pages, 5 x 8.5 inches, or 13.5 x 21.5 cm, by Monte Farber & Amy Zerner. Illustrated, hardcover. Publisher: St. Martin's Press. Printed in China. Comments: The back of the box says, Five diagramed card layouts. Quick read guide. Works with virtually any tarot deck. Interprets every card, in every position. Provides sample questions you can easily personalize. Cards with endless detail. It could be the artist wants to make all the cards look very, very pretty, but it could also be that you have to really look at these cards to see what's going on. Suits: Swords, Wands, Pentacles & Hearts - this last a welcome change. Court cards are King, Queen, Prince & Princess. For some reason, all the Queens are close-ups, as with the Queen of Pentacles, above. The other court cards are full-length. All the figures on all the other cards are tiny. Suits are color-coordinated: All the major arkanas are lavender. 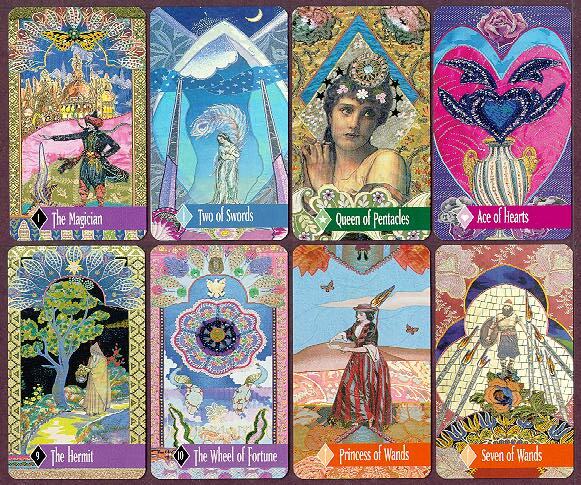 Wands are orange/red, Swords are blue, Hearts are pink, Pentacles green. Despite the detail, or maybe because of it, I find myself getting lost in these cards, which is a good sign. Cards you like to hold & look at are cards that get used, whatever I might say to the contrary. Nearly identical to The Enchanted Tarot.